Try our new version at coinprices.org - faster, easier to navigate, and no frames. All of our prices (Market, FMV, PCGS, NGC, CAC & Plus (+) Prices) are now accessible through the new Online FMV Price Guide as well as through the normal Member/Dealer Subscriber entry. A�subscription or membership is required for member areas. 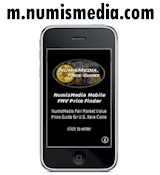 The prices listed within the NumisMedia FMV Price Guide represent our Fair�Market�Value determination for a properly graded coin within each category. The NumisMedia Online Fair Market Value Price Guide (all grades, Good through MS70) is FREE to all visitors and does not require a password. Subscribers to our Monthly FMV Price Guide also get online access to the Plus (+) and CAC Price Guides. NumisMedia Price Guides are constantly changing and updated�daily. The NEW NumisMedia Photo Gallery has some of the finest examples of dates and varieties from many series within NumisMedia Price Guides. Additional images are added to the database weekly. Click on coin photos or the accompanying links for articles, charts and price comparisons. CAC and Plus (+) prices are now available in the Online FMV Price Guide and can be accessed within the FMV charts, comparisons and graphs. 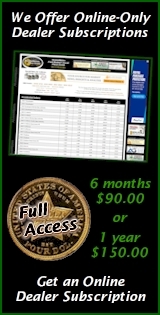 You must be a NumisMedia Subscriber or Member to access the CAC and Plus Price Guides. 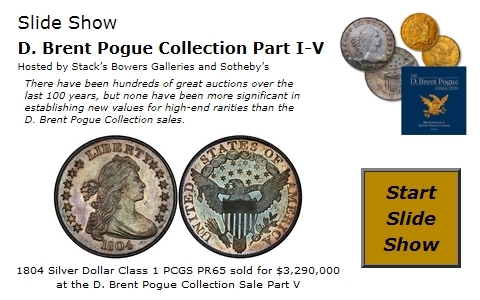 Read more about the effects of CAC on the numismatic marketplace; "CAC Rarities STILL Realizing Higher Premiums." First, select the series you wish to view above. Next, select the grade range you wish to review. 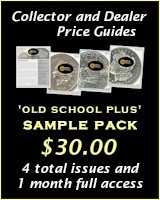 NumisMedia Online Price Guides include all grades from Good to MS70. Select 'No Frames' to view our printer friendly version. Learn how to use FMV Prices in your Auctions and Web Site. A listing of General Grading Standards for U.S. Coins is provided with definitions for grades Good to Uncirculated as well as AU and MS.
A listing of Numismatic Abbreviations is provided in an alphabetical index. Linking your website to NumisMedia is simple and free, just copy and paste the code below to your website.